Wandsworth Council has recently received petitions from local residents expressing concerns at traffic levels and “rat running” vehicle speeds on residential roads in the area. Following investigations by town hall highways engineers it is clear that many peak time motorists are leaving the A3 at Tibbet’s Corner and using residential roads to avoid traffic queues on West Hill. The worst affected roads include Withycombe Road, Princes Way, Keevil Drive, Skeena Hill, Girdwood Road, Granville Road and Merton Road which are used as cut-throughs to avoid congestion on West Hill. As a result, the council has drawn up proposals to deter non-local motorists from using these quieter residential streets. 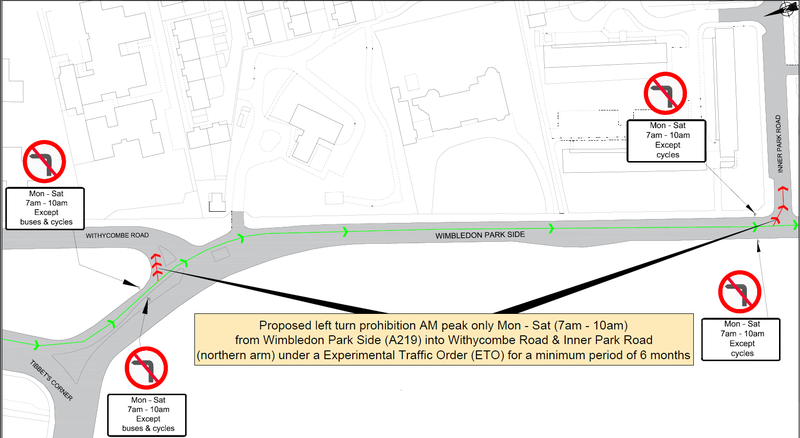 Accordingly, for a minimum six-month trial period to test its effectiveness, early morning traffic will not be permitted to turn left into Withycombe Road and Inner Park Road (northern section only) from the A219 Wimbledon Park Side. This will prevent traffic from using Withycombe Road and Inner Park Road and then feeding onto other nearby residential roads. A map illustrated this proposal can be found here. These new arrangements will apply between 7am and 10am and cover the busiest time of day for commuters. These restrictions will not apply to buses and cyclists. During the six-month experimental trial period, which is expected to commence on March 25, the council may need to take additional steps to address changes in traffic flows and driver behaviour. If further changes are needed local residents will be notified in advance. However, the expectation is that after a settling-in period, traffic is likely to stay on West Hill or find alternative routes into Wandsworth town centre. Further traffic surveys will be carried out to enable “before and after” comparisons and the scheme will be actively monitored to ensure drivers comply with these changes – with camera enforcement used if appropriate. The council is keen to hear the views of local people throughout the trial period. The views of local residents and businesses will help determine whether or not this experimental scheme should be made permanent, dropped or amended. If you have any observations, please share your views using the online form below by 31 August 2019. If you need a paper copy, please contact us at consult@wandsworth.gov.uk.